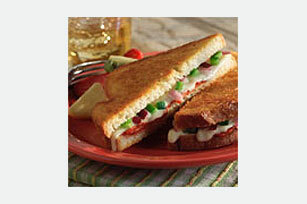 Why is our Pizza Grill Sandwich everyone's favorite? It's everything you love about a slice of pizza, in handy "to-go" sandwich form. Spread bread with pizza sauce. Cover each of 2 bread slices with 1 Singles and 1 Tbsp. each peppers and onions; top with second Singles and second bread slice, sauce-side down. Spread outsides of sandwiches with vegetable oil spread. To add whole grains to your diet, prepare using whole wheat bread. Omit pizza sauce, peppers and onions. For each sandwich, cover 1 bread slice with 1 KRAFT American Singles, 2 tomato slices and dash of dried oregano leaves; cover with second Singles and second bread slice. Spread with 2 tsp. vegetable oil spread and cook as directed. Makes 1 serving. Omit green peppers and use 1/4 cup chopped red peppers instead.